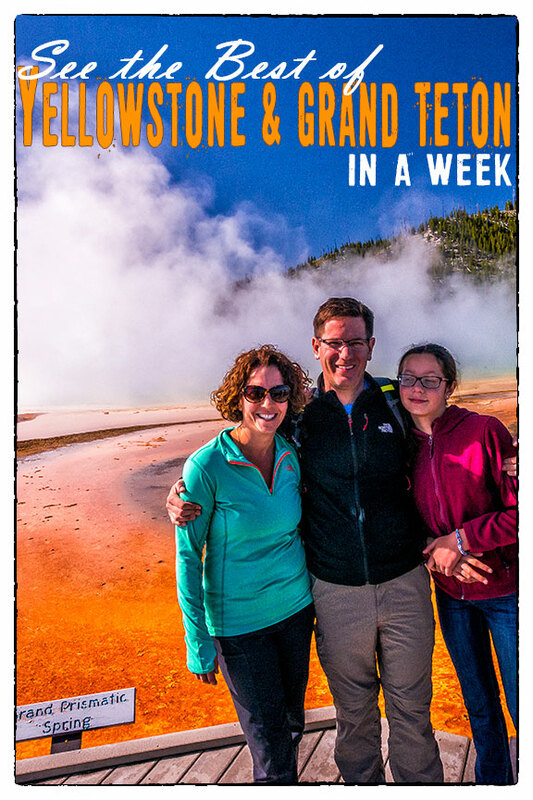 Visiting Yellowstone and Grand Teton National Parks on the same trip may seem like a huge undertaking. Together, these two world-class parks—separated by only 31 miles via the John D. Rockefeller Parkway—encompass nearly 4,000-square-miles. 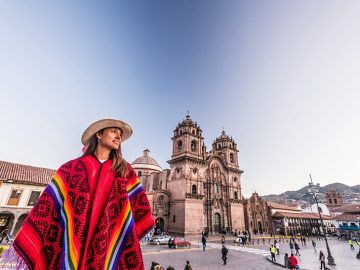 But if you take some time to plan before you go, it’s definitely possible to tackle both of these stunningly-beautiful destinations in one trip without feeling like you’re rushing from one scenic view to the next. If you’re an early riser, grab breakfast and coffee on the go at Pearl Street Bagels just off of the main square in Jackson before making the 15-minute drive into Grand Teton National Park. 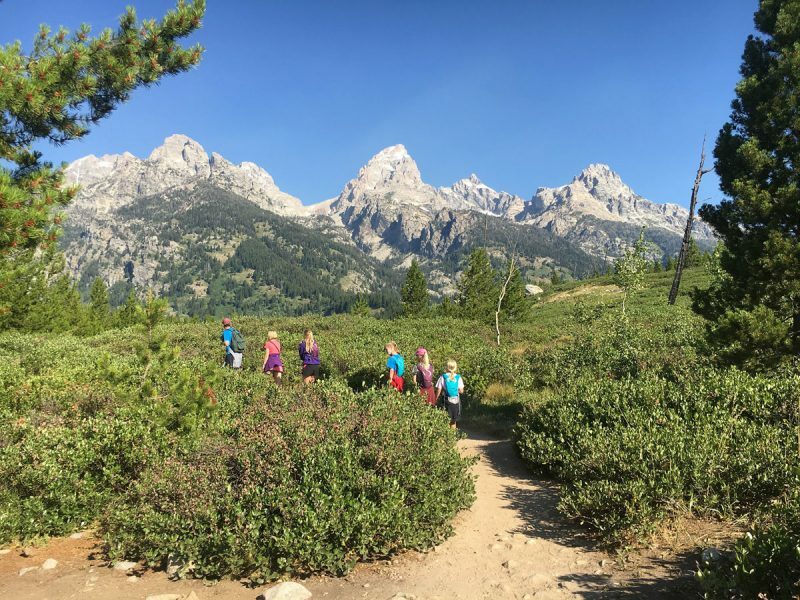 From the park’s Moose Entrance Station, follow the main road to the Taggart Lake Trailhead and tackle the moderate 4.7-mile Taggart and Bradley Lakes loop hike, which offers expansive views of snow-capped peaks before taking you to two stunning glacial-formed lakes at the base of the Tetons. Both lakes will beckon you for a dip. Go for it! And if you’re short on time, just make the shorter 3-mile round-trip hike to Taggart Lake. 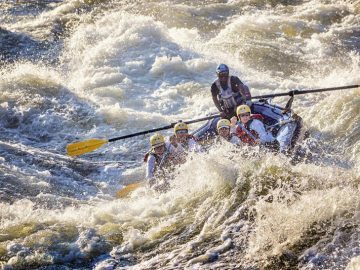 By late morning, you should be on your way to the Signal Mountain Boat Launch, the meeting spot for a 3-day, 2-night Jackson Lake kayaking and Snake River rafting adventure. 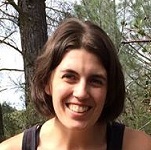 If you’re skeptical about dedicating three days of your trip to a guided adventure, don’t be. 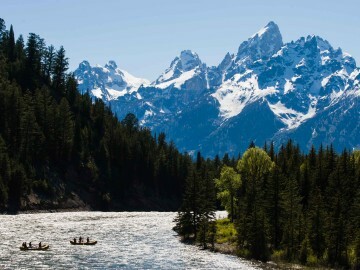 This boat-supported trip with catered camping is probably the easiest way to go off the grid in Grand Teton National Park and even offers an exclusive opportunity to sleep under the stars on Grassy Island. 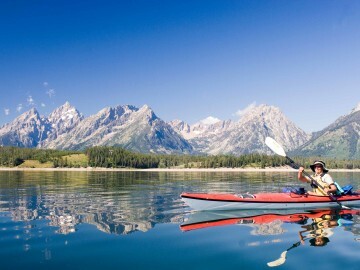 When you’re not exploring the endless inlets of Jackson Lake’s shore by kayak, you’ll have the chance to hike to waterfalls, cascading creeks and alpine lakes few visitors see each year. 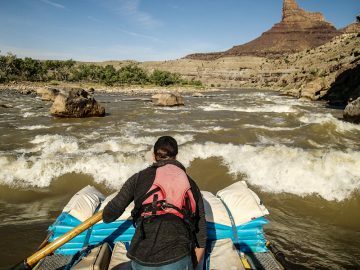 Then, as a finale to the trip, you’ll hop on a raft and float a scenic stretch of the Snake River, enjoying a unique perspective of the park and a chance for incredible wildlife viewing. It’s the perfect way to go behind-the-scenes while maximizing your time in the park. At the end of Day 3, don’t miss your chance to grab dinner back in Jackson at the Snake River Brewery and dessert at Moo’s Gourmet Ice Cream before snapping a selfie in front of the antler arches surrounding the iconic town square. Then, settle in for the night at Jackson Hole Lodge. This conveniently located hotel in the heart of town has comfortable accommodations and a pool, which the whole family will love. Hit the road early to maximize your time in Yellowstone National Park. With the sun rising, catch your last views of the majestic Tetons as you travel back through the park toward Yellowstone’s South Entrance. Time it right and you’ll reach Old Faithful before the crowds and tour buses descend. This world-famous geyser erupts every 35 to 120 minutes. Check the schedule and if it’s expected soon, grab a spot with a good view and wait for the show. Or, try to catch the eruption from from a unique vantage point along the boardwalk trail which winds its way through the Upper Geyser Basin. 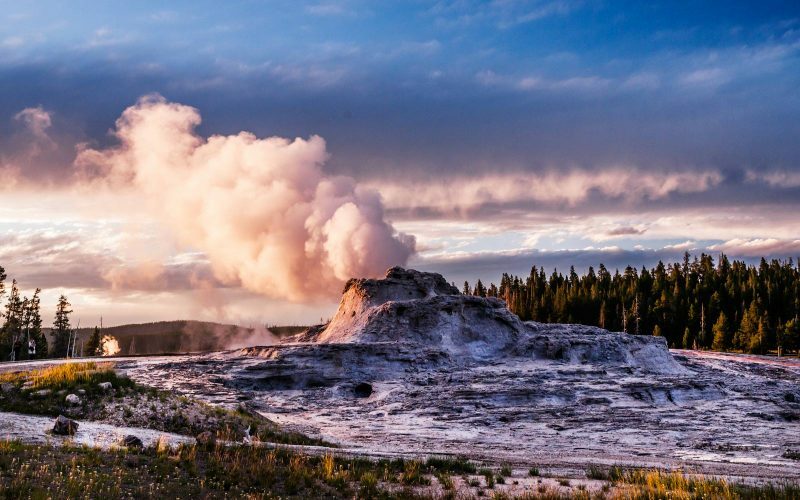 Plan for at least two hours to wander here and don’t miss cool sights like Castle Geyser, which has a long and powerful eruption that rivals Old Faithful. Grab lunch at the Old Faithful Lodge before making your way to Biscuit Basin for an afternoon hike to Mystic Falls. Don’t be scared off by the packed parking area, the majority of the visitors are here to see the small area of geysers and colorful springs that dot the half mile trail and boardwalk leading to the trailhead. Just past the boardwalk, follow the pleasant 1-mile jaunt into the woods and eventually along the Firehole River before reaching 70-foot Mystic Falls. You can do an out and back or make the 3.2-mile loop which involves a bit of scrambling up some steep switchbacks. If you have small children, it’s best to go back the way you came and enjoy the wildflower-filled views along the river. If you still have some energy to burn, make a stop at the iconic Grand Prismatic Spring before driving to Canyon Lodge & Cabins at Canyon Village. If you can snag a spot at one of Canyon Lodge’s new rooms (which means booking 6 – 12 months in advance), it’s well worth it. This centrally-located, not to mention recently renovated park lodge, is conveniently located near the Grand Canyon of the Yellowstone and makes much of the driving in the park a lot more manageable. For more convenience, grab dinner tonight at Canyon Lodge’s diner or cafeteria, which has something for everyone. If you want to see some of Yellowstone’s more elusive wildlife like wolves and grizzlies, grab your binoculars and start your day by heading to Lamar Valley in the park’s northeast corner for your best chances. 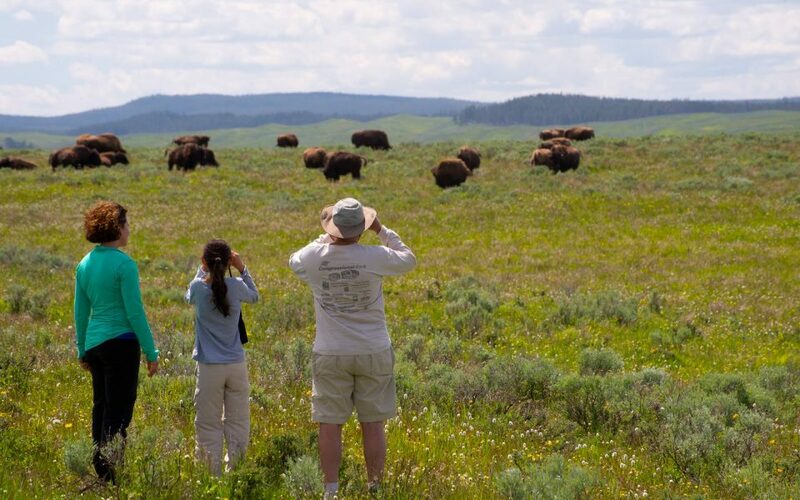 Also home to herds of elk and bison, Lamar Valley is considered one of Yellowstone’s best areas for wildlife viewing. Afterward, try to beat the crowds to impressive Tower Fall, two miles south of the Roosevelt Lodge area. Take a quick peek from the overlook, or better yet, do the short, but steep half-mile hike to the base of the 132-foot falls. Then, head to the historic Roosevelt Lodge or find a scenic picnic spot for an early lunch before tackling a big afternoon hike. Ask insiders for a Yellowstone “best hike” recommendation and it would be surprising not to hear Mount Washburn. There are two ways up, but from the Dunravan Pass Picnic Area the route is slightly more shaded as the trail climbs 1,400-feet and approximately 3 miles one-way. While it’s not an easy undertaking to climb to the 10,219-foot peak, the views alone are well worth the effort. At the top you’ll see the Grand Canyon of the Yellowstone to the east, Hayden Valley and Yellowstone Lake to the south and on a really clear day you might even be able to catch a glimpse of the Tetons. You’ll want to rest after this big accomplishment, so make your way back to Canyon Lodge for dinner and a night cap in the lodge’s Dining Room. As you make your way to the northwest corner of the park today, plan for an early morning stroll along the boardwalks of the Norris Geyser Basin. 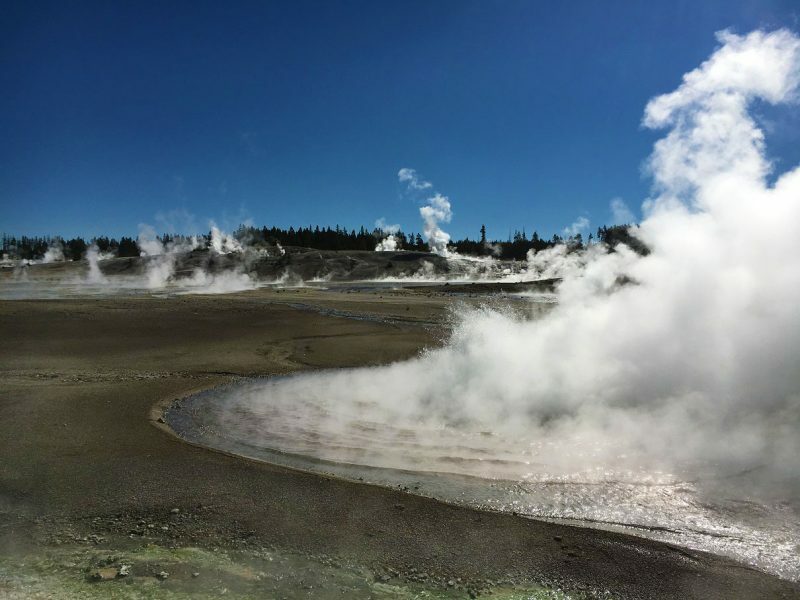 This geothermal area, the hottest in the park, offers a surreal experience as you wind through a diverse assortment of springs, geysers and pools, including Steamboat Geyser, which is considered the tallest in the world and can reach heights of 380-feet when it erupts. Next, drive to the Mammoth Hot Springs area. If you enjoy soaking in natural hot springs, you won’t want to miss the opportunity to take a dip in the “boiling river” a stretch of the Gardiner River where a hot spring mixes with the cool river to create a natural hot tub. To get there, drive 2.2 miles past Mammoth Hot Springs toward the parks north entrance and look for the parking area at the 45th Parallel. 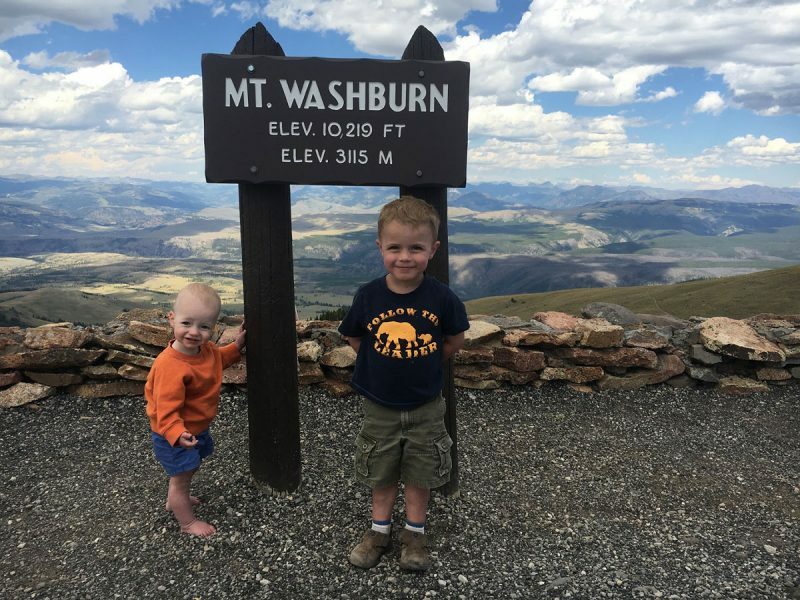 From here it’s an easy .5-mile one-way hike to the “tub.” Your muscles will thank you after hiking Mount Washburn. Back in Mammoth Hot Springs, you can spend some time strolling around the terraces. Or, explore the area’s historic district, which includes Fort Yellowstone and other structures from the 1800s and early 1900s when Yellowstone National Park was first established. Later, experience another piece of the area’s history on Roosevelt Lodge’s Old West Dinner Cookout. For this adventure, you’ll hop on a horse for a 1- or 2-hour ride to Yancy’s Hole and enjoy real cowboy grub around a crackling campfire—just like Yellowstone’s first pioneers. 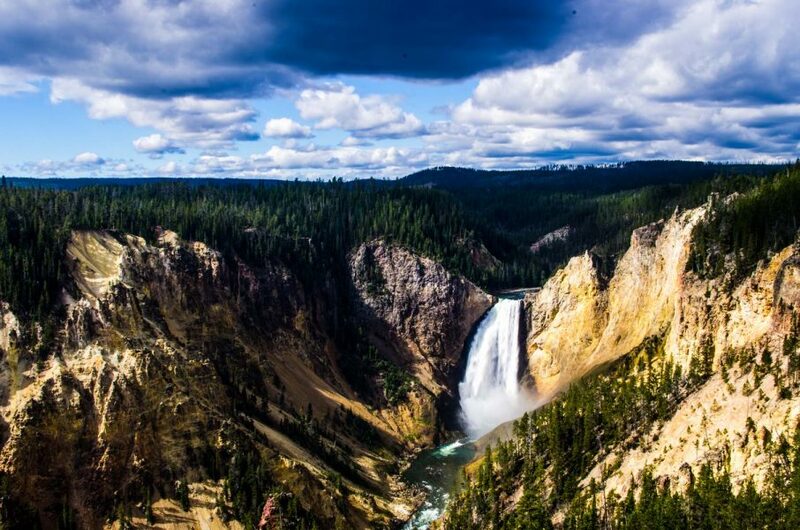 Take advantage of staying so close to the Grand Canyon of the Yellowstone and hit the easy, 1.5-mile Brink of Lower Falls Trail first thing in the morning for a cool view from the top of Lower Falls. Get there before 8:30 a.m. and you might even have this trail to yourself. Then, zip over to the canyon’s south rim to take in the iconic view from Artist Point. 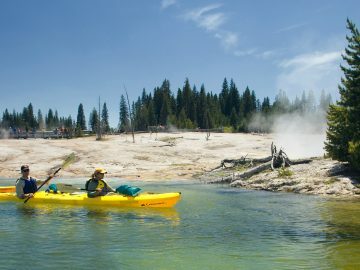 From here, head south to Yellowstone Lake where you’ll meet up with an outfitter for a half-day kayaking trip and a unique exploration of the geysers, hot springs and bubbling mud pots of the West Thumb Geyser Basin. 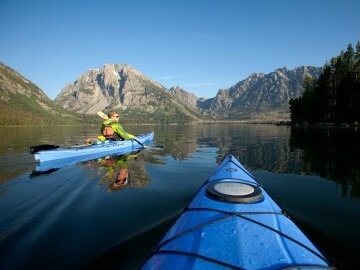 Yellowstone Lake Kayaking trips depart several times per day, but shoot for a mid-afternoon departure and you’ll have plenty of time for an unexpected “Bison jam” along the way and a picnic lunch next to the Yellowstone River. 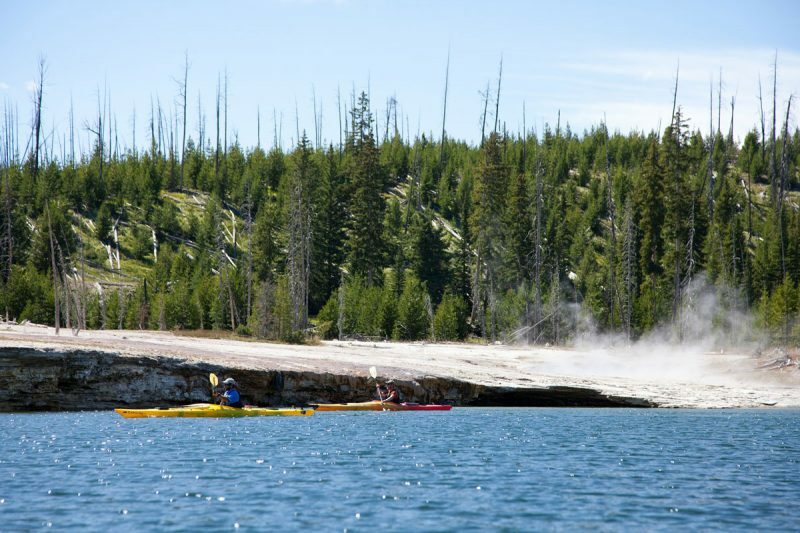 After you explore the geothermal wonders along Yellowstone Lake’s shoreline by kayak, you’ll be ready for dinner at Yellowstone Lodge—the park’s oldest lodge. Then, enjoy your final chance to take in the park’s incredible wildlife as you drive through the bison-rich Hayden Valley at dusk. 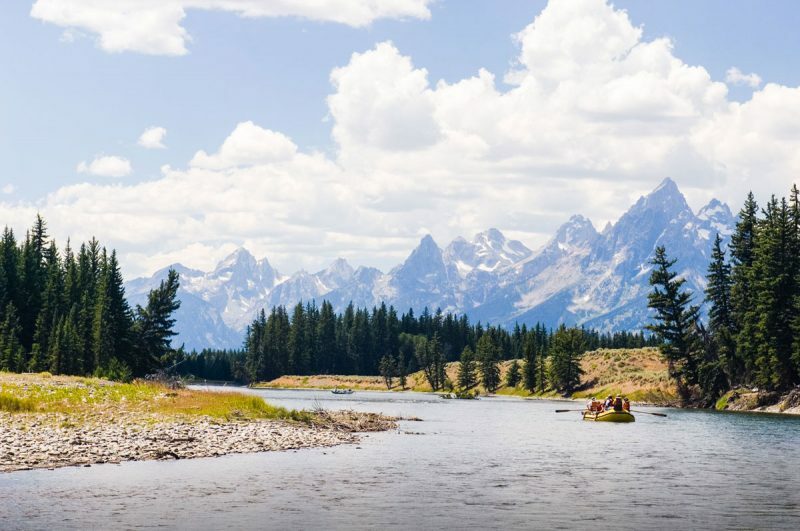 It’s impossible to see it all, but this epic week-long itinerary will leave you feeling pretty satisfied with your Yellowstone and Grand Teton National Parks vacation.